Colombian Computer Science student in Mexico. Aspiring researcher and game developer. Fan of movies, literature, comics and video games. So far, almost all software I’ve tried to run under Windows 7 has worked without any problems. 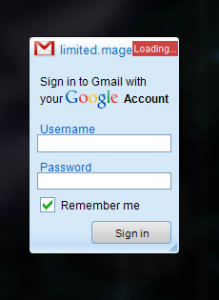 Today I installed Google Desktop, and everything was working fine until I added the Gmail gadget. As soon as I clicked the sign in button, Google Desktop became unresponsive and eventually came crashing down. All other gadgets I’ve tried, including the new Google Calender gadget, work fine. There’s a thread about this in the Google Desktop Help group. I guess we’ll just have to wait until Google fixes this, unfortunately. Continuing through my adventures with Windows 7 beta, I came upon a weird bug today. Something called the Distributed Link Tracking Client crashed. With it, Aero and my Internet connection also went down. The problem fixed itself within a minute. Nothing major, I guess, but it is a beta after all. Windows Explorer feels much faster. Opening folders in removable drives, particularly, is considerably faster than is Vista. Cross that, Windows OVERALL feels much, much faster. The new preview API for the taskbar is awesome. In IE7, all tabs are previewed. In Media Player, playback buttons are added. Minor graphic enhancements are very welcome and greatly improve functionality and aesthetics. Very little bundled software apart from IE, Media Player, Media Center, Paint and Wordpad. Mail, Photo Gallery, Movie Maker, etc, will be free downloads. This makes the base installation faster and smaller. Updated versions of Paint and Wordpad are good, but the updated Calc is one of the best calculator apps out there. HEXelon Max is obviously better and always my choice when my TI-84 isn’t at hand, but this Calc PWNS the calculator app bundled with Linux, something the XP and Vista Calcs could only dream of. Picture slideshows as desktop pictures. I don’t know if this will be exclusive to Ultimate, as it currently is in Vista (the beta is only available in Ultimate edition), but since I’ve always used Vista Home Premium, this is a nice change. Windows that have progress bars show them in their taskbar item. This is extremely useful, to say the least. This includes IE downloads (although IE’s download system remains considerably crappy, without even a pause option). The new way the taskbar groups windows. Thankfully, this can be disabled and I could go back to the “classic” view where each window has its icon and label, with the cool addition that window labels of the same program are kept next to each other and the window previews are shown at the same time. Non-Microsoft programs are not yet compatible with the preview API for the taskbar. So, no all tab previews for Firefox (tried with Shiretoko too). Hopefully, Mozilla and other developers will add this functionality soon. 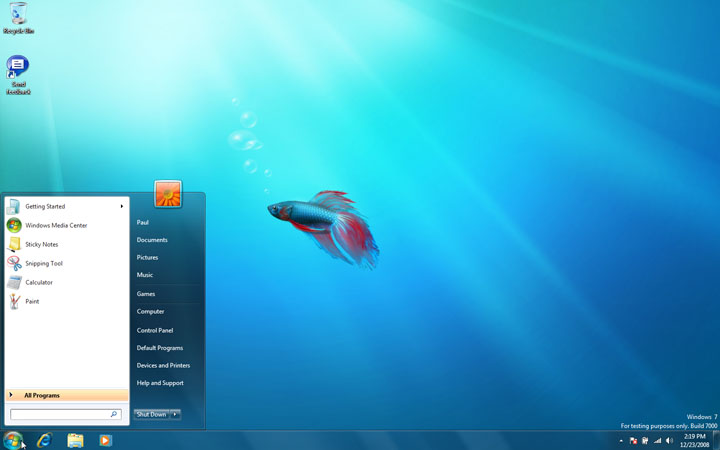 Selected programs in the taskbar are shown white. Since I enabled labels, the white text on white background combination is very difficult to read. Some drivers had to be installed manually (graphics card and Bluetooth). Oh, well. I guess we can always expect Windows to always leave some driver-hunting to us. As a sidenote, ALL of my hardware is working perfectly after installing Vista-specific drivers. My Windows 7 beta installation, after installing Office 2007 and Firefox, takes up 11.4 GB. I’m guessing that Office takes up a little less than a gigabyte, plus 2GB each for the hibarnation file and the page file, would give a core installation of less than 7GB, which is about the same as Vista. Not bad at all. I seem to have a love-hate relationship with the new taskbar, but I think it’s just a matter of getting used to it. Changes in UI from Vista are considerable, but not nearly as many as from XP to Vista. The control panel, one of the most painful changes I had when I started using Vista, remains virtually unchanged except for some useful and natural minor UI enhancements. My Veredict: Awesome, best Windows to date. When this finally comes out, hopefully sometime this year, it will be a much-welcomed update to the already very powerful and stable OS Vista is.